In a very chic neighborhood just north of the Champs-Elysées and south of the Parc Monceau is a late-19th century home that once belonged to a very rich family. After the death of both Edouard in 1894 and Nélie in 1912, the residence was handed over to the Institut de France (created by Cardinal Mazarin in 1661) for the purpose of becoming a museum so all the world could admire their art collection as they and their guests once did. In addition to a tour of the house, which is still furnished and decorated as it was when it was their home, there are now temporary art exhibits in a part of the upstairs. 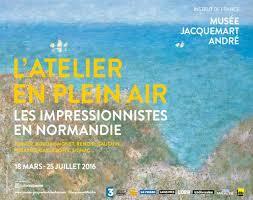 The one showing now is “The Impressionists in Normandy”. During the late 19th century, just as the Impressionists were rewriting the precepts of what art is, Normandy became a vacation spot. Spurred by the British, who seemed to enjoy bathing in the cold waters of the English Channel, this coastal region northwest of Paris became very much in vogue. Many artists chose it as a setting for their easels, starting with Boudin and including Courbet, Degas, Monet, Morisot, Pissarro and Gauguin for the French, Jongkind for the Dutch and Turner for the British. Over fifty works by these artists - their impressions of Normandy - are on display on the upstairs level of the Jacquemart-André home. The exhibit provides excellent explanations on panels in the various rooms. Unfortunately they are only in French. But you can get an audioguide in English - or other languages - as you enter. The panels and audio commentary give a background of the Impressionist movement and walk you through the various works. The first room has a wonderful canvas by Claude Monet, one of my favorites, but I admit a weakness for Monet. It’s called La Charrette (The Wagon), and shows a horse and cart disappearing down a snowy lane past two typically Norman-style houses. 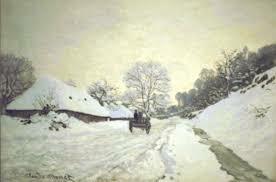 The sky is that thick, sodden off-white that anyone from cold climes will recognize as promising more snow. Its snowy landscape foreshadows one of my all-time favorites of the artist, painted four or five years later: The Magpie, with the bird perched on a gate in another snowy, but more sunlit Norman landscape. Both are usually at the Musée d’Orsay, another favorite of Impressionism lovers. The second and third rooms focus on the Normandy beaches and all their social activities: swimming and boating, but mostly people walking along the boardwalks of Deauville or Trouville, or women sitting in the sun under a parasol. There’s also one of Degas’s first paintings of a horse race, and a Caillebotte from the Toledo Museum of Art: Regatta at Trouville. The fourth and fifth rooms contain views of several ports, and especially a Gauguin canvas of Dieppe on loan from Manchester, England, and a marvelously simple seascape with startling blue water by Berthe Morisot that usually lives in the Virginia Museum of Fine Arts. 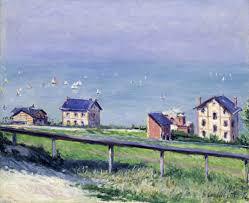 There’s also a second Morisot, a view of the port of Cherbourg, on loan from Yale. In the last rooms are a duo of Monets, hung side by side, and they’re very different from what one usually expects from that artist. They are both fishing boats and from the 1860s, but drawn in the Japanese style, with a flat stroke and bold black outlines. They have never been seen together before, especially as one is from a private collection and the other from a museum in Bucharest, Romania. With all these different museums represented, plus pieces from Germany and a Turner from the Ashmolean Museum in Oxford, England, this is truly a wonderfully international collection of masterpieces. The Impressionists may have painted side by side along the Normandy Coast as the 19th century drew to a close, but you will never see these canvases together in one place again. Well worth the time to drop by the Jacquemart-André Museum if you’re in Paris. The first part of this exam is a commentary of a text - last year a text by Lamartine, Racine, Ionesco or Victor Hugo - and it counts for one-fifth of the final exam grade. A “commentary” is a highly stylized approach to a text, and you better have the formula down pat. Depending on what kind of college studies they’re planning, seniors will be in one filière, one educational lane, or another. For the moment, those lanes are Literature, Economics, Science, Technology or the Arts, although they’ve evolved over the years. The 0-20 grade you get on the philosophy exam will be multiplied by a “coefficient” that varies depending on which lane you’re in: multiplied x7 if you’re in Literature, x4 for economics, x3 for science and art. (Don’t know what it is for technology.) So if you get a 10 on the exam and you’re studying in the Literature lane, you chalk up only 70 points toward the total that will say “Open Sesame” to the School of Your Choice. If you get a 15, you’re up by 35 points to 105 and things are looking rosey. The age of students taking the bac varies, but 17 or 18 is the norm. The questions are the same for all, regardless of age. Last year the youngest candidate was 13; the oldest, 91, a senior citizen who sat down to the exam at the same time as his teen-age grandchild. P.S. Given what’s at stake, you can well imagine that knowing what questions are going to be asked would afford you an enormous advantage. And there has been skullduggery in the past. Which explains why the test folders are kept in a safe inside a safe inside a safe, all 60 million copies of them. It also explains why any misprints are not just thrown away but shredded. No dumpster-diving possible. With the high terrorism alert level this year, the subjects are not the only things being carefully guarded. Thinking that blowing up several hundred high school students might be an easy target for Daesh, this year the students have to be there early (7:20 am for a start at 8 am). They must have valid ID and their bags will be searched, as will those of anyone working in the establishment. As if those poor students weren’t already stressed out enough! - Are our moral convictions based on experience? - Is desire unlimited, by definition? - Does working less mean living better? - Do you have to be able to prove something in order to understand it? - To be just (fair), must you obey the law? - Can we always justify our beliefs?